Chicago Cubs and Major League Baseball are suing vendors for trademark infringement. The club included photos of vendors and their wares that allegedly violate the team's trademark with the lawsuit. WRIGLEYVILLE — The Chicago Cubs are suing dozens of T-shirt and hat vendors who work the streets in Wrigleyville, accusing them of selling counterfeit goods and "deliberately free riding" on the team's success. The club, along with Major League Baseball, filed the suit in federal court Thursday. Along with seven named defendants, they are also suing 30 additional vendors whose names are not known, including some that sell online. The lawsuit includes photos of the named vendors selling their wares this month near Wrigley Field. The defendants are accused of selling hats, T-shirts, flags and other apparel with the Cubs logo and other trademarked designs. The club is accusing the vendors of counterfeiting the federally and state-registered MLB marks and infringing on the trademarks, while also diluting the brand. "Confusingly similar imitations of the MLB Marks has caused and is likely to cause confusion, deception, and mistake by creating the false and misleading impression that the Infringing Goods are manufactured or distributed by [the Cubs]," the lawsuit states. The league and the Cubs are asking that the defendants be permanently banned from selling the infringing products and recall those already sold so all can be destroyed. The lawsuit also seeks to force the vendors to surrender any ill-gained profits to the league and pay triple the amount of damages due to their "knowing, willful and intentional use of" the trademarked logos. As the visual symbol of the Cubs brand, the logo and other designs "are extremely valuable and important," even more so as the Cubs enter the playoffs, the club states. With interest in the team at "an all-time high," the vendors have "flooded" Wrigleyville and the Internet with unlicensed products that "brazenly" use the trademarks, the lawsuit said. It lists the Cubs C logo, the W flag and old logos like the Cubs face, the bear inside the C and the Chicago logo on a gray background as images exclusive to the Cubs, along with the words Cub, Cubs and Cubbies. The club also claims rights to uniform designs; references to team history like its 1908 championship; the names, images and uniforms of Cubs players and managers; broadcast personalities like Harry Caray; slogans and imagery related to Wrigley Field, the marquee, scoreboard and ivy-covered walls. 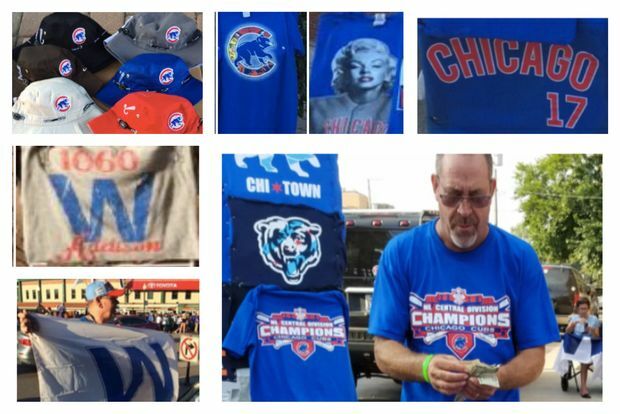 Photos of the accused show them selling off-brand T-shirts, like one featuring Marilyn Monroe in a Cubs jersey, along with bucket hats sporting the Cubs "C" with a cub running through it. Others offered newly printed shirts heralding the Cubs as the National League Central Division champions, while some sold "W" flags, the suit alleges. Along with the street vendors, the Cubs are suing some for doing business online. Other unnamed defendants "do not maintain fixed storefronts or permanent website" but only sell from temporary structures on game days near Wrigley Field.